The topic of black women in mainstream media is very salient one. 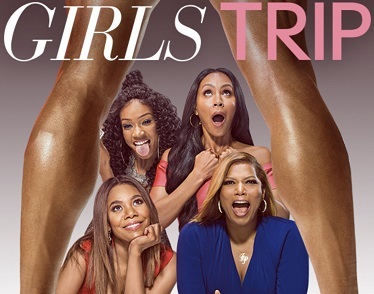 Just recently Hollywood has been buzzing with the movie Girls Trip, raking in a cool $30.4 million in its weekend debut. The movie is said to be the funniest comedy of the year, and while it is incredibly lighthearted this film’s depiction of black women carries a lot of weight. Very rarely are black women, especially black women that are 30+ yrs of age, shown to be fun-loving and carefree. They haven’t been given the space to have narratives like that. Similarly, black women are rarely given the screen-time to express, and have full agency in, their sexuality. This film does both! Historically, (with the exclusion of tv and films largely viewed and marketed toward black audiences, many of which aired in the 90s – think Living Single, A Different World, etc.) mainstream media has given black women very restricted roles to play. We are often relegated to the “mammy” or “jezebel” stereotypes. The mammy is dehumanized and devalued as a lesser intelligent, and often humorous, character. The jezebel’s dehumanization happens through her hyper-sexualization. She’s the lure, the beguiling homewrecker that draws men into her trap, destroying “good” (read: white) marriages and “good” (read: white) families. Even contemporary depictions of black women tend to fall into this tired trope, one such example being Scandal. Many could say that Olivia Pope is one of the most empowering black female roles we’ve seen in recent mainstream television. Yet and still, her relationship with the president, a white man, is shown to break apart his marriage and be a risk to the continued success of the country as a whole (seeing as Fitz is shown to, time and again, run away from his duties to be with Olivia). His wife is still the victim, and Olivia is still a villain, not given the rights or respect she deserves as his long time lover. Black women are often portrayed as one dimensional characters, painted with broad strokes. One of the better portrayals of a black woman I have found that defies the mammy stereotype is Annalise in “How to Get Away with Murder”. Annalise is a middle aged black woman, well established as a high powered lawyer (which is, in itself, immediately defiant of expectations). She is incredibly intelligent, ruthless, and cutting. She cheats and uses people, and she does it in a world where that is expected and venerated. Far from falling into the “overly passionate angry black woman” stereotype , she is portrayed as calculating, almost cold. However, she is also vulnerable at times; she gets hurt, she gets tired, she cries. She is at once cunning, conniving, and compassionate, at least to some. She’s given the space to be all of this, and more still, a sexual being with agency. See, Annalise also happens to be bisexual, and is shown in canonical sexual relationships with both men and women. In both situations she knows what she wants and is able to express it. She isn’t desexualized in the least, which would be expected for a character in her age range. Whatever my other issues with the show, and the show’ s other characters, Annalise remains one of the most candid and complex black female characters I have seen in mainstream media, period, and I applaud HTGAWM (and Viola Davis) for that. Black actresses have a difficult time finding roles in Hollywood because people in the business still buy into these stereotypes of type casting. Yet, it is so important that we have dynamic representation. Not only for those young women looking out into the world to see positive images of themselves reflected back at them, but also to challenge long held stereotypes of what black women are and who black women can be. I’m glad for Girls Trip’s success and hope that we see much more success like it in the near future.